NORTH BILLERICA, MA--(Marketwired - Sep 28, 2016) - MV Products has introduced a new line of high capacity, dual vacuum inlet traps that are mounted on carts for large substrate vacuum deposition processes used in manufacturing TFT-LCD, OLEDs, solar cells, and crystal growing. MV MultiTrap® Duplex Carts feature two 16" high capacity vacuum inlet traps supplied with a broad selection filter cartridges to meet specific customer requirements for high flow vacuum deposition processes. They provide up to 160 sq. ft. of filtration surface area, 60 grams per sq. ft. of particle retention, and permit easy access to process components for maintenance. Protecting vacuum pumps, people and the environment, MV Products is a division of Mass-Vac, Inc. was founded in 1971 to serve customers in need of vacuum pump support and service. After years of field experience rebuilding vacuum pumps and analyzing the reasons why they failed, along with extensive research and development the MV Products division was created. MV Products manufactures a complete line of vacuum inlet traps, exhaust traps, mist eliminators, and oil filtration systems for a wide range of manufacturing, laboratory, and commercial applications including universities and hospitals. 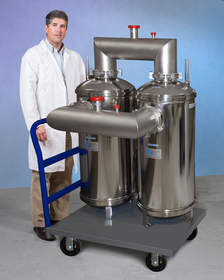 Mass-Vac, Inc. specializes in solving the process contamination problems associated vacuum systems that are used with processes such as MOCVD, HVPE, PECVD, or LPCVD which generate high volumes of particulates. These processes, of course, are used in manufacturing green products such as solar cells, HB-LEDs, and Li-Ion batteries. Mass-Vac, Inc. is an active member of SEMI and the American Vacuum Society. MV MultiTrap® Duplex Carts feature two 16” high capacity vacuum inlet traps to meet customer requirements for high flow vacuum deposition processes.